tanz kunst werk addresses traditional dances of the world with new perspective. Based on the aesthetic and historico-cultural analysis of world dances, fusions are developed considering dance as language. Classical Oriental Dance, for example, comprises a lot more than discovering femininity and colourful costumes. Dancers of tanz kunst werk consciously cross genre borders in terms of music, repertoire of movement and stylistic idiom. Dance forms have changed, like languages, over time through various influences and will continue to change. Consequently only snapshots of dance forms can be preserved, the dance form itself lives. As well, classical Oriental Dance and Folklore are not static. Students of tanz kunst werk obtain insights in different dances and cultures as those of North Africa, Iran, Gulf States, Turkey, India, China and Europe. Due to the great spectrum, the focus of dance lessons varies. It is our target to give you individual access to dance beyond any clichés. Each course focuses on imparting profound dance technique. Who wishes to express himself with his body, has an advantage when he knows his body well. Special attention is placed on a healthy body posture. This supports muscle growth and helps to ease the strain on joints and spine. Positive effects also show up in daily life of dancers. And please don’t bother: Every age and body is able to dance! Dance form combining elements of minimum two dance styles. 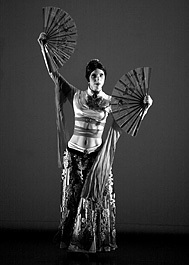 Movements of Oriental Dance meeting influences of other dance styles. More than a dancer dressed in black, scowling and moving three steps forward and three back. This dance style lives through its emotional intensity! Once having the courage to leave prejudices behind, you will find a great variety of e.g. music – from Electro or tough Metal over gentle, romantic sound to classical orchestra music. Equally diverse is the repertoire of movement and expression of this dance style. Here, the interrelation of visual and performance art is particularly strong. A fantasy style which originated in America and is based on the rich movement repertoire of different traditional dances. Typical movements of Tribal Style, influenced by various other dance styles.